This spring I participated in a foot washing ceremony. Two actually. The first occasion was planned. I was part of a team who washed the feet of women who dedicate their lives to service. We took off the participants’ shoes, placed their feet in warm water, washed and massaged them with oil before drying their feet to put on the shoes again. The experience was a privilege as our team honored others who serve. The second occasion wasn’t planned. 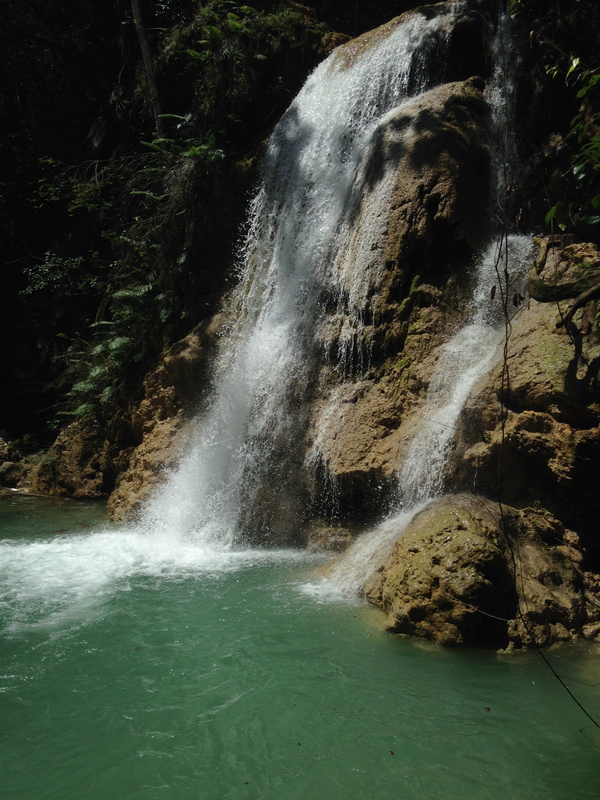 It happened the following day when a small group of us rode horses for nearly an hour over some rough terrain and then hiked about half an hour to a secluded waterfall in the Dominican Republic. We each had a guide who provided the horse and led the way. After we enjoyed the waterfall, we took off our shoes and waded across the river to explore another path. I sat down on a large rock at the other side of the river to put my shoes back on. That’s when Miguel, my guide, surprised me when he began to wash my feet before I could even dig the socks out of my shoes. But it was to no avail. He was going to wash my feet. He poured the cool river water on them and rubbed off the rocks and dirt I accumulated from the river’s edge. Next he put on my socks and shoes, and tied them. At the end of the day I paid Miguel when I dismounted his horse at the trailhead. I paid him for his day of service, which began when he rode his chestnut horse 6 kilometers from his home to the tourist site where I mounted for the trek. I left him with an extra tip. He left me with a lot to ponder. At first I pondered how sore I’d be for riding a horse for a couple of hours and hiking up and down the mountain. Next I pondered how I felt when Miguel washed my feet, and how I felt compared to the previous day when I washed others’ feet. 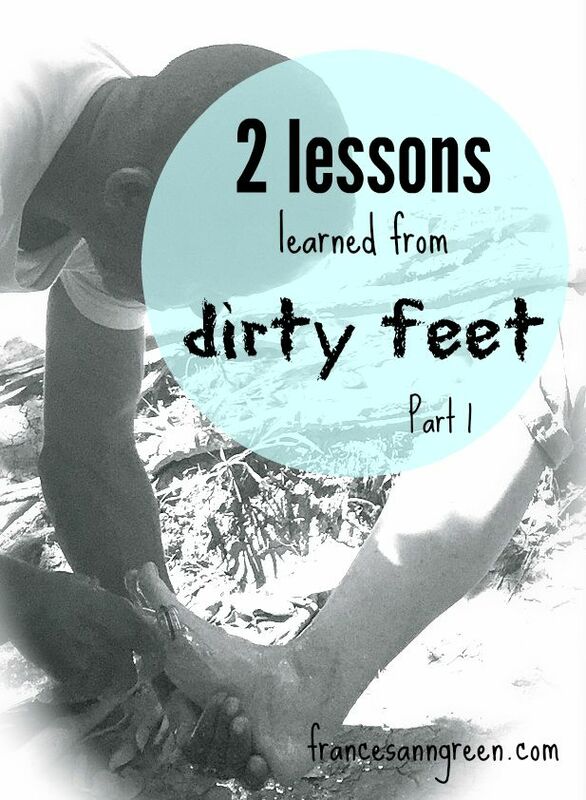 The two experiences helped me reflect on the story when Jesus washed his disciples’ feet. My dirty feet at the side of the river eventually took me on a path to see my heart at the cross. I know the two stories don’t seem like they have much in common—my dirty feet and Jesus dying on the cross. But they do because they both involve someone else cleaning up my mess. It’s difficult for me to comprehend my response to the cross, but I can grasp what I felt when someone else washed my dirty feet. My responses to Miguel helped me understand my responses to Jesus. I’ll share the first response with you today, and in the next post (“When “Thanks!” is enough”) I’ll share the second response I saw. Resistance– My first reaction to Miguel washing my feet was to resist. Since I tried to resist Miguel’s service, I know I would have resisted if Jesus approached me on his knees to wash my feet. I would have been rummaging in the kitchen for another towel while Peter argued with Jesus. I would tell Jesus that I’d rather help, that I could learn by doing it with him. “I’ll wash James’ feet while you wash John’s.” It would be more practical, efficient, and I’d feel more comfortable. But when it came to dirty feet, Jesus wouldn’t allow the disciples to resist his service with a towel. Receive, don’t resist. When Jesus washed their feet, he taught them to serve others, but he also taught them to be served. Jesus didn’t allow them to skip the lesson of receiving, because if they did, they would skip an important lesson of giving. I don’t know about you, but my self-reliant independent lifestyle has allowed me to overlook that lesson. I’ve focused on the call to humbly serve and skipped the first invitation to humbly receive. There have been occasions that forced me into the posture to receive–maybe you’ve been there too with health, grief in loss or financial issues. But in general, it’s been easy to skip the first lesson of humility and quickly pick up a towel to serve others. But since the disciples couldn’t resist, neither can I. My dirty feet reminded me to receive like they did when Jesus approached them with a towel. So maybe you are like me–struggling to grasp the story of Jesus on the cross or wondering how to serve as Jesus served. Maybe you find yourself standing at the cross and your feet aren’t the only thing dirty because you’re unsure of how to receive such a gift. Imagine your response to Jesus on the floor with a towel. Listen to Jesus and your heart, and allow the story to massage your heart to humility. Humbly receive Jesus on the cross– Washing their feet was nothing compared to what was about to happen. Jesus was on his way to the cross. If the disciples couldn’t humble themselves to receive Jesus’ gift of service, then there is no way they could humbly accept his gift of salvation. 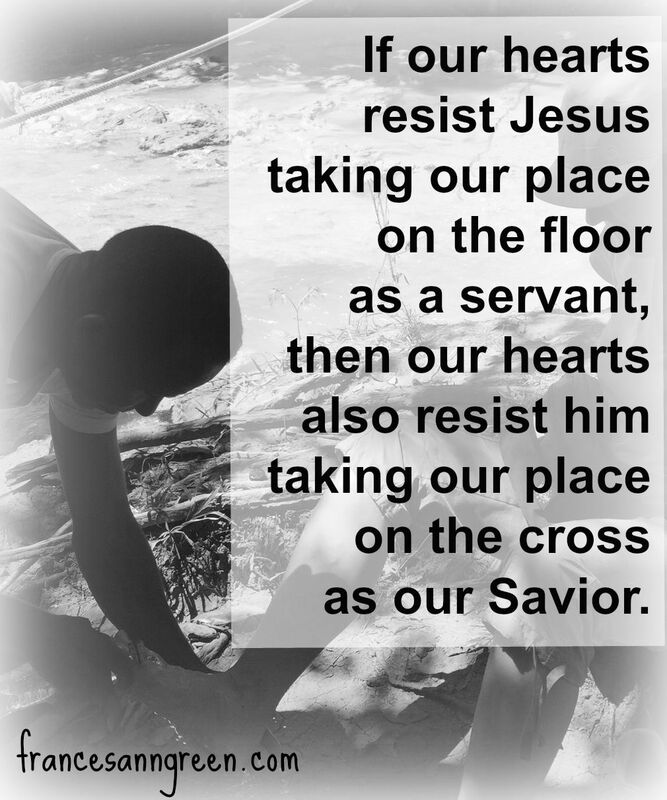 If our hearts resist Jesus taking our place on the floor as a servant, then our hearts also resist him taking our place on the cross as our Savior. Serve others with humility– Jesus insisted on washing their feet before he commanded them to do the same for others. They learned about humble service to others by first humbly accepting Jesus’ gift of service. If we try to skip that lesson, we run the risk of serving others out of pride rather than humility. We can end up serving others to feed our ego or soothe our conscience rather than serving because the Master first served us. After my friends and I walked along the new path, we returned to wade across the river again. Once again, Miguel was ready to wash my feet. The second time I didn’t even protest. Rather than resist, I tried to graciously receive. Even though it felt awkward, I’m thankful for the experience because he reminded me to receive, not resist. He reminded me that the first step in my relationship with Jesus is to receive with humility rather than proudly resist. Then I can follow Jesus’ example to serve. In the next post, “When Thanks is Enough,” I’ll share the other attitude that my dirty feet helped me see in my heart. Until then, get your feet dirty and reflect on what you see when Jesus approaches you with a towel. This sounds easy, but it takes soulful work. Leave a comment to let us know what you learn from your dirty feet (or from any other occasion when you’ve been in a posture to humbly receive rather than resist).